100% wild-caught Salmon with lemon and butter. 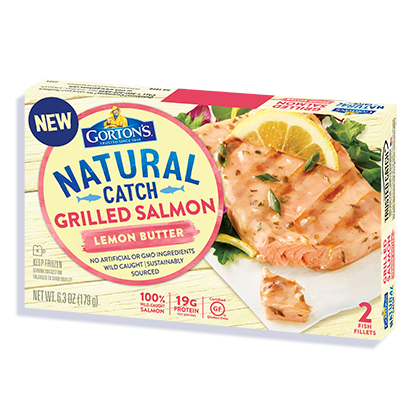 Bring the flavor of outdoor grilling to your kitchen table with our Lemon Butter Grilled Salmon. Sustainably wild-caught Salmon expertly seasoned and char-grilled is as tasty as it sounds. Made with only simple ingredients and no artificial ingredients – it’s simply irresistible. Water, canola oil, butter (cream, salt), potato starch, sea salt, cane sugar, nonfat milk, cream solids, citric acid, whey, dehydrated lemon peel, natural flavor, parsley, spices.